21/3/11 – Discovery – In a press release issued on 19th March, the Real Academia de San Fernando confirmed the news published two days earlier by El Pais. 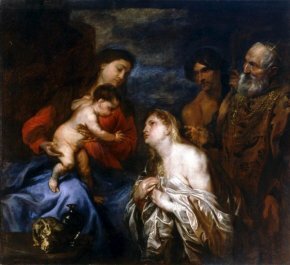 A painting which until now had been considered a copy of Van Dyck painted by Mateo Cerezo (ill. 1) and resided in the storagerooms has been re-attributed to the Flemish master himself by Matías Díaz Padrón, the curator of Flemish paintings at the Prado, after returning from its restoration. The canvas represents The Virgin with Child and Three Penitents (David, Saint Mary Magdalene and the Prodigal Son). According to the museum, it dates from 1625 and, until 1643, belonged to the Viceroy of Naples, the Duke of Medina de las Torres, before being transferred to the Escorial, then to the Academia at the beginning of the 19th century. A version of this composition, with several variations and in a slightly different format, from the Louis XIV collection, resides at the Louvre (ill. 2).